Preparing to brew your first beer. The easy suggestion here is to tell you to brew what you like to drink. Unfortunately, this will come with a lot of caveats, and you might have some misunderstandings about what beer you even like. The craft beer industry has done a lot to really help people understand a lot more about different types of beer, but this post is going to give you a little information to help you decide what you want to brew your first time out. Lagers, ales and California Commons, oh my! Because beer has been around for so long, a lot of the terms like “beer” and “ale” have actually changed a lot since the terms first came into usage. I’m not going to go into the historic definitions of these terms now, but I will give you a bit of a primer in what they mean today. The first myth I want to dispel is that ales are bitter, or lagers are watery and flavorless. The differences between ales and lagers, while they do make quite a bit of difference in the end flavor of the beer, have little to do with how bitter or strong tasting a beer is. Ales are brewed with ale yeast, a top-fermenting yeast. What does that mean? Top-fermenting yeast tends to sit at the top of the beer while it’s fermenting. You get a thick, white/tan foam floating on top of your beer called krausen (you do get krausen with lager yeast as well, but it’s typically a lot smaller.) Ale yeasts are typically fermented at higher temperatures (60-75ºf) and can add slight fruity or spicy flavors to the beer. Most craft beers are ales. They’re typically easier to make, and tend to have more complex flavors than lagers. Lager literally means “storage” in german. Lager is brewed with lager yeast, a bottom fermenting yeast. While ale yeast eventually drops to the bottom after it’s consumed all the sugars it can, lager yeast typically falls to the bottom very quickly, and is referred to as a bottom-fermenting yeast. When brewing with lager yeast, you end up with a much smaller krausen. You typically ferment lagers at lower temperatures (45-55ºf), and then “lager” (bring the temperature of the beer slowly down to roughly 35ºf and then keep it at that temperature for several weeks) the beer once fermentation is done. Budweiser is a very widely distributed example of a lager, but not all lagers are pale, lightly flavored beers. Lagers span the entire spectrum from extremely light to extremely dark. Lagers are more difficult to make, and have a “cleaner” flavor. By that, I mean you won’t get many of the fruity or spicy characteristics that you typically get with ale yeasts. There is one more type of beer that doesn’t really fall into either of those two categories (well, sours don’t really fit into either of the other two categories either, but that falls outside of what you’d likely want to make for your first beer.) The California common is a beer that is fermented using lager yeast, but at ale fermentation temperatures, and not lagered. One of the most well know examples of a California Common is Anchor Steam Beer. Typically, these beers are a bit cleaner tasting than ales, but a bit more complex than lagers. They’re also considerably easier to brew than a normal lager. That’s great, but how do I decide what to brew for my first batch? My suggestion is to make an ale or California Common for your first batch. You will have a lot of new things to keep track of your first time brewing, you’re probably best off not adding the complication of making it a lager. The main source of sugar in beer is malt, grains. You can either extract the maltose (grain sugar) yourself by soaking the grains at a specific temperature for a period of time, or you can buy malt extract where someone has already done the work of extracting the maltose from the grain for you. Stick to extract with specialty grains (grains that add additional flavor to the beer) for your first beer. Using malt extract instead of doing an all-grain batch eliminates a lot of work. While you might eventually want to go all-grain, the first time you make beer is already going to be a lot of work, and you don’t want to end up doing so much that you end up discouraged an unwilling to do it again. I’m also going to suggest buying a recipe kit for your first batch. Formulating a good beer recipe is actually fairly difficult, and even following someone else’s recipe can be difficult your first time. Kits eliminate a lot of the guess work, all of the ingredients are already measured out and packaged in a way that makes them easy to use. Check to see if your kit has any specialty grains, and if they do, ask to have them crushed by the people you’re buying it from. Crushing the grains helps you get more flavor out of them, and it can be difficult to do it properly at home. As for what to make beyond that, make what you like. If you like lighter beers, make a lighter beer. If you like darker beers, make a dark beer. Very, very light beers can be hard to get right because any off-flavor will stand out like a sore thumb. This kit is very similar to the first beer I brewed: Homebrewing Kit: Irish Red Ale w/ Munton's 6 gm dry yeast. Next week, we go through the basic brewing process! So how often do you use a kit compared to following a recipe or making up your own? I love how many options there are for picking a beer to make! And thank you for explaining the difference between an ale and a lager! I actually mostly use kits. I'd say I do non-kit recipes about 20-30% of the time. Mostly it's laziness on my part. If I'm doing a non-kit recipe I either have to find or come up with a recipe, buy the individual ingredients, which are likely not in the right proportions for the recipe, so then I have to measure out the correct amounts. You can get a better, or at least different beer that way. Going with a recipe kit, on the other hand, all you need to do is look through the kits that are available and buy the one that looks good. I'm starting to get more into making my own recipes though. 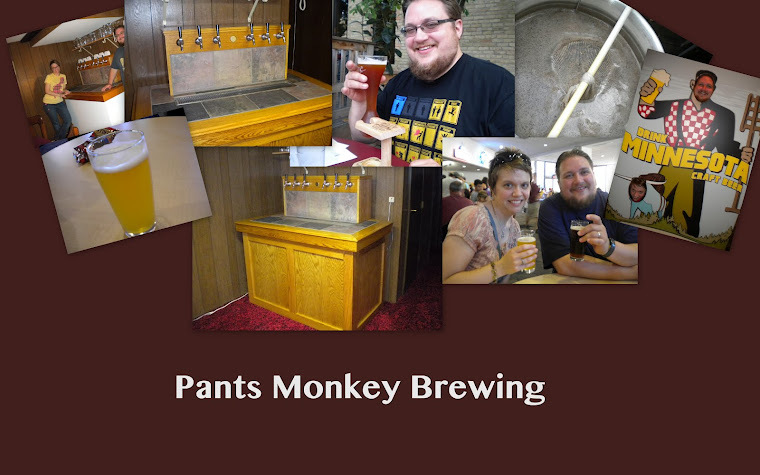 Hello Pantsmonkey (Nate- mwa ha ha, we know your real name!!!!) Nice to meet you! I came over on Bethie's recommendation! This is highly interesting, I always wondered why bitters had that thick cloud of foam on top that sat there whereas the lager one disappears swiftly! Now I know! What does Hoegarden beer (the blonde one) count as?! Hi Kezzie, my wife, Bethie, was looking over my shoulder when I read your comment and exclaimed "Ooh, that's Kezzie, you'll like her, she's fun!" I'm guessing you're referring to the Hoegaarden witbier. That's an ale, specifically it's a Belgian Wheat Ale beer (or witbier, as the name says). The reason it looks so cloudy is that it's unfiltered so there's still yeast and some other stuff floating in the beer. Yeast is actually pretty good for you, it's full of various vitamin B complexes. Belgian beers are pretty cool actually, they're fairly unique in the brewing world, the beers tend to have a lot of fruity or spicy flavors to them, mostly because of the yeast used in the brewing process, but some breweries actually add things like orange peel or spices to the beer to give it that flavor. A lot of craft brewers and homebrewers try to replicate the Belgian styles because they are so unique. I say somewhat unique because actually, traditional French beers are brewed similarly to traditional Belgian beers, but the French seem to downplay the fact that there even is such a think as French beer. It's considered a bit uncouth.